PARIS (Reuters) - Britain's request for a delay to Brexit will be rejected by the EU if Prime Minister Theresa May cannot provide sufficient guarantees that her parliament will approve the divorce deal she negotiated, France's foreign minister said on Wednesday. The French stance was markedly tougher in tone than the public rhetoric out of Berlin, where Germany's foreign minister said only that an orderly British departure from the European Union would solve the Brexit turmoil. 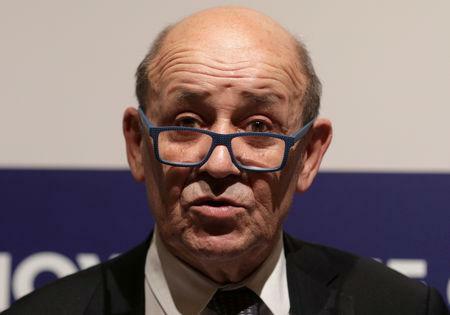 "A situation in which Mrs May was not able to present to the European Council sufficient guarantees of the credibility of her strategy would lead to the extension request being dismissed and opting for a no-deal exit," Jean-Yves Le Drian told the French National Assembly. A senior official in President Emmanuel Macron's office said May had requested a "technical extension". This suggested that approval would be conditional on the British parliament ratifying the withdrawal agreement negotiated by May. In recent weeks, Germany has appeared to adopt a more conciliatory stance. Paris and Berlin are discussing their response to May's delay request, a source familiar with the diplomatic effort said, with Macron and Chancellor Angela Merkel due to meet on Thursday in Brussels, on the sidelines of an EU summit. Speaking in Berlin, German Foreign Minister Heiko Maas said he expected EU leaders to make a decision on how to proceed with May's request at that summit. "We'd like to know where it leads," Maas told a news conference in Berlin. "We've always said that if the (European) Council has to decide on a deadline extension for Britain, then we'd like to know why and what for."